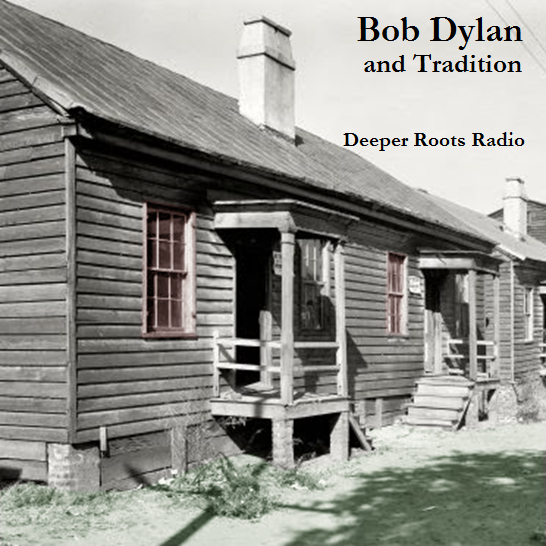 It’s our regular (well, even Saturday mornings) show featuring an early country and bluegrass set featuring new sounds from Steve Earle and Robert Earl Keen, Jr. alongside the classic sounds of Buck Owens, Leon Chappell and The Louvins. 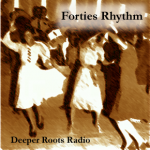 We’ve got gospel and blues as well as a rare set of sounds from the second omnibus of “The Rise and Fall of Paramount Records”, classic late twenties country and blues. Stay tuned for your morning dose of brew d’Roots and American Roots Breakfast Tea on a spring Saturday morning in West Sonoma County. While Bob Dylan’s greatest early influence was likely Woody Guthrie he spent his career exhibiting both love and thievery of the Americana music canon. Love, in the sense that he would pay tribute and admire the story-telling, and theft, in that he would copy old lines for his own purposes or reassemble them into a larger story. His not-so-obvious album release titled “Love and Theft” hints at his own sardonic wit in the matter. Pablo Picasso has been quoted thusly: “Good artists borrow, great artists steal.” It’s a concept that goes back much further. The works of T.S. Eliot discuss the concept of how artistic theft leads to the creation of new ideas in art and many of the early playwrights, Shakespeare included, would steal in part or in whole. The argument that Dylan’s intentions are somewhat more nefarious in the era of copyrights and royalties is likely misguided because it assumes that no artist would have previously been paid for their ‘pilfered’ works. 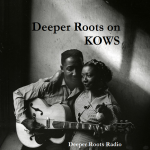 In this episode of Deeper Roots, first broadcast on KWTF Sonoma County March 20, 2015, we’ll spend two hours mining through some of those influences with music from Jerry Garcia and David Grisman, Doc Watson, Frank Crumit, Mississippi John Hurt, and the bard himself in an episode titled “Bob Dylan and Tradition”. 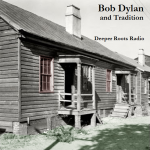 In keeping with our theme, parts of today’s show are loosely based, or maybe paraphrased, from a wonderful study of Dylan’s career in the context of American tradition including minstrelsy, gospel, folk, country, pop, and blues…all of those things that Dylan has imparted in sometimes not-so-subtle ways in his music. The book, Bob Dylan in America: the book by Sean Wilentz, contributing editor to the New Republic and Professor of History at Princeton. The book was published by Doubleday in 2010. 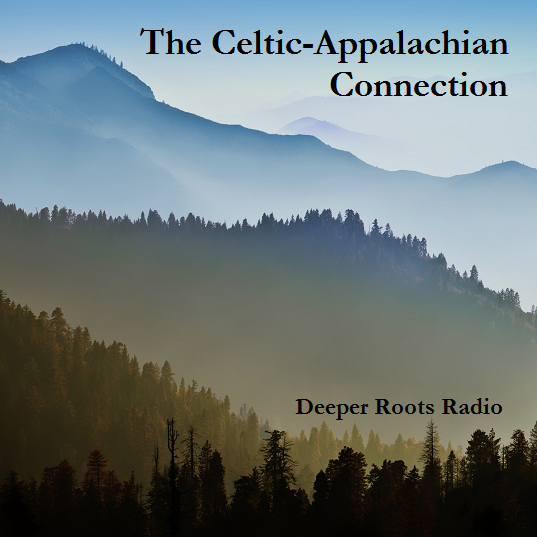 In this special edition of Deeper Roots, we’ll spend some time with selections of Celtic origin that traveled with the memories of home from over the seas and into the mountains of Appalachia. These mountains were not only home to immigrants beginning in the 17th century, but also a haven for slaves who escaped the South during the Civil war and 19th century Civil War deserters. Out of all of this, some kind of musical serendipity seems to have happened. We’re excited to have three guests who will be talking about two upcoming events in the Bay Area this month. 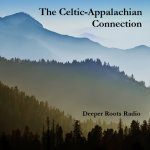 Joining us by phone will be musician, Celtic music evangelist, folklorist, and professor of music and Irish studies Mick Moloney and traditional Irish musician Athena Tergis who will share some of their insights into the migration of the Irish into Appalachia as well as sorting out the jig, the reel, and the hornpipe. Also joining us to discuss the upcoming event A Celtic Appalachian Celebration: Traditional Irish & American Old Time Music will be Margaret McPeake, one of the producers of the Festival whose credentials are overwhelming. She’ll share details about Irish-American Crossroads, an organization that has been producing the event for the past twelve years. We return once more to a theme. In this episode of Deeper Roots, we visit the ‘salt mines’ where we toil for our daily bread or made to work off our sins. 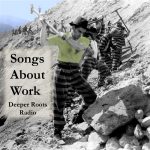 The old addage, attributed to Thomas Edison: “There is no substitute for hard work.” left out the other side of the coin…that of paydays on Friday and working for the weekend…which, of course, we’ll cover in great detail in a show whose theme is ‘work’. Tune in for roots music from Doc Watson and Flatt & Scruggs, both wicked and lovely R&B from Marva Whitney and Fats Domino, and rebellious rocking from Eddie Cochran and Bo Diddley. He was from the Piedmont school of blues guitar but would find a wider audience and following through the work of Taj Mahal, Dave Van Ronk,Bob Dylan, Jorma Kaukonen, Dave Bromberg, and Ry Cooder. The majority of those named actually studied guitar with Davis but his own tutelage was under the legendary Willie Walker. He moved to New York in 1944, preaching and singing on the streets of Harlem, resuming his recording career in the 1960s when his appearances at Newport and other folk festivals brought a seemingly brief fame…but by all indications today, an enduring legacy. If you don’t have his classic album, Harlem Street Singer, produced by Rudy Van Gelder, in your collection…you might want to reconsider. We’ll explore a wide selection of pieces by Davis, by those who influenced him, and the many who were influenced by his music. 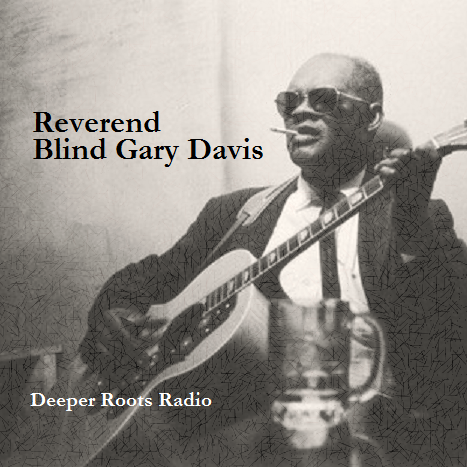 We’ll also share excerpts of interviews and classic Gary Davis stories by others. It’s a very special two hours on Deeper Roots Radio: A Century of America’s Music with your host Dave Stroud.